Here we are now, it is the last day of the Summer School course Managing Sustainable Forest Landscapes. This has been a hard work for me as a coordinator but also a very valuable experience. Here I just want to thank everyone that have made this happen and especially students that were keeping on the focus during lectures and the whole course. 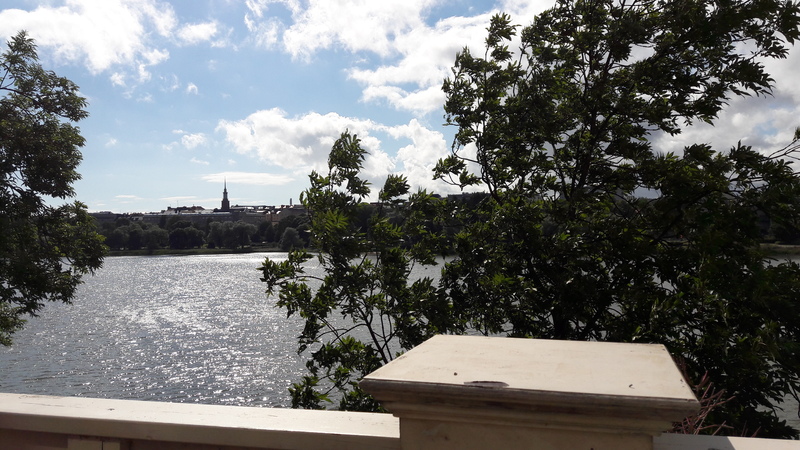 On behalf of VITRI and Helsinki Summer School, Thank You ! Today it was time to take a closer look at the group works. We had four groups that gave a presentation about one of the four commodities and the value chain. First to start were Stephen and Qudratullah and their topic was beef/cattle. Second topic was palm oil and Ling Ma started introduction and Hugh Brown continued the presentation. After lunch, afternoon lessons started and it was Kaleena’s and Maria’s turn to talk about the soy and give a presentation. Last but not least we had a presentation about cocoa given by Ahmed and Samuel. They made a nice comment about how 9 of 10 people like chocolate and the 1 that do not is lying. presentations. 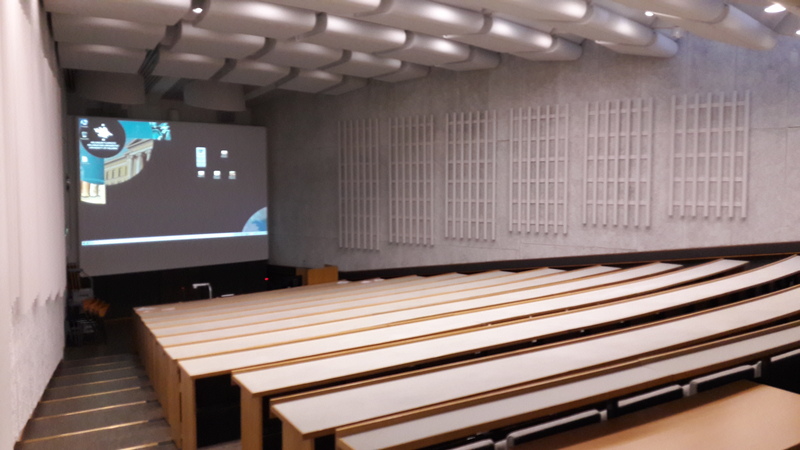 Shortly after noon, the public seminar started in Lecture Room B2, a spacious and contemporary lecture hall shaped like an Amphitheatre – and indeed the show began with Prof. Markku Kanninen calling the seminar to order and giving a brief introduction. Dean Marketta Sipi of the Faculty of Agriculture and Forestry, University of Helsinki graced the occasion by giving the opening remarks. 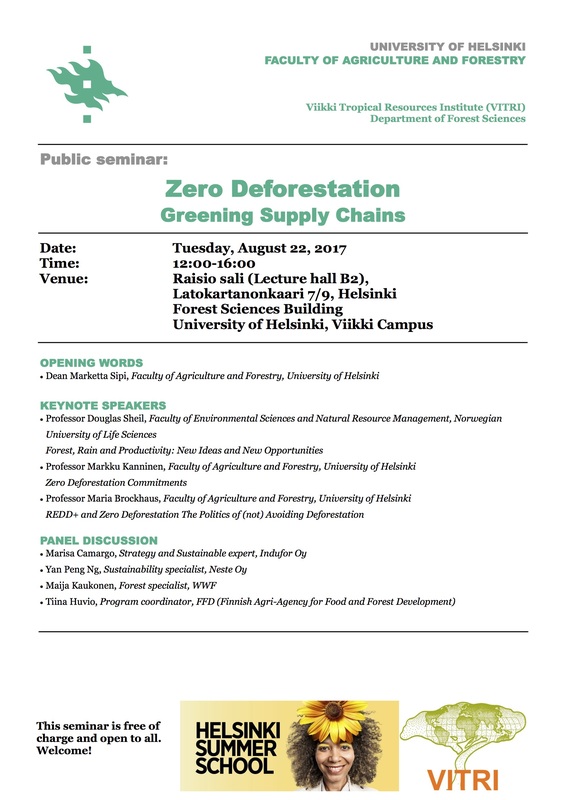 Her brief but insightful statements set the right tone for a fruitful discourse on the vision of achieving ‘zero deforestation’ within global supply chains of key commodities whose production, processing, and distribution is causing forest loss with its associated adverse impact biodiversity, greenhouse gas emissions, erosion, water pollution, etc. The event line up a number of highly acclaimed and published scientists of internal repute for the keynote addresses; these were Professor Douglas Sheil of the Faculty of Environmental Sciences and Natural Resources Management of the Norwegian University of Life Sciences, Professors Markku Kanninen and Maria Brockhaus both of the Faculty of Agriculture and Forestry, University of Helsinki. Prof. Sheil discussed forests, rainfall and productivity. 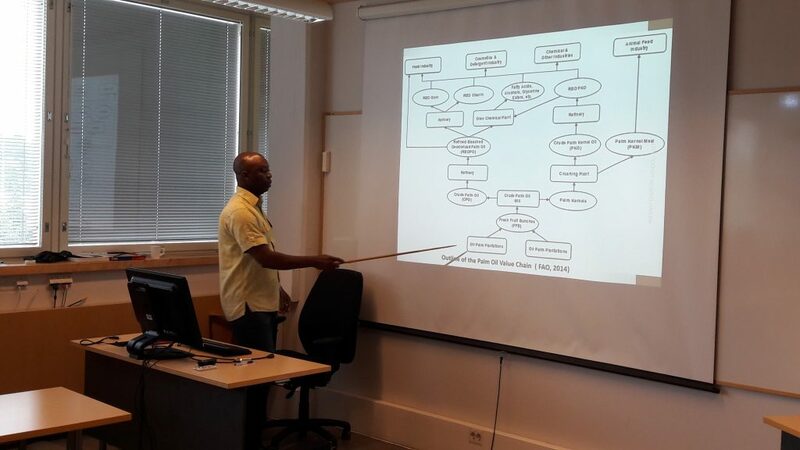 He addressed the issues and current knowledge about the effect of trees and forests on rainfall and groundwater and indicated that contrary to early assertions about trees depleting groundwater stocks; current scientific studies suggest the opposite, more especially in the drier regions of the world with less than 1000mm annual rainfall. He stressed that tropical forests because of their large leaf area, high canopy height, and rough surface act like ‘machines’ for evaporating moisture which contributes to cloud formation and rainfall. Their relative distances from the oceans where winds with relatively higher pressures flow inland however influence this ability. He was however quick to admit that there is still a lot that is unknown concerning what really influences rainfall in the tropics. To an hypothetical question regarding ‘greening’ the deserts, he responded that he believed we can vegetate the desert areas, but we need to go large scale, possibly 100 km wide, then we can create conditions that will ‘attract’ rain so that the system can self perpetuate. He stressed that the world needs to focus greater attention on water conservation, and that currently about half a billion people around the world face water scarcity, and the situation is getting worse – “Water is a much Bigger issue than Carbon”, he concluded. Prof. Kanninen was quite brief in his presentation. He indicated that though the call for sustainability in the production systems of the world’s key agricultural commodities has been fairly recent, for over 200 years forestry and forest management systems have been designed along sustained timber yield principles. He announced that as at August 2, 2017 the world had consumed resources that our planet can sustainably supply in one year – our annual quota. This means we are now taking from the earth what is not due us. He stressed the need for sustainable consumption levels and adoption of more eco-friendly lifestyles and production systems to reduce our ecological footprint to save our planet. 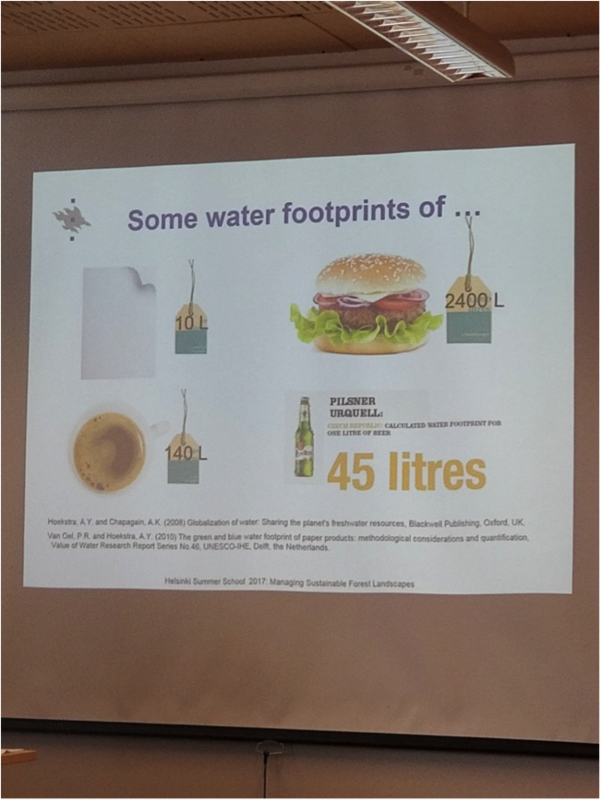 Prof. Maria Brockhaus highlighted the key commodities whose production is contributing significantly to deforestation: palm oil, timber/pulp, soy, beef and cocoa – The Big Five! She indicated that these five commodities alone are reported to contribute to 4 million hectares of forest loss annually. She stressed that we need to internalize the footprint concept practically into our production systems to be able to influence behavioural changes within the various commodity industries. According to her, deforestation and forest degradation goes way beyond the forestry sector therefore focus should be placed on global food chains, policy and regulations within producer countries and non-state actors. She highlighted a situation she described as ‘ politics of unsustainability’ and expressed worry that more and more state actors within producer countries seem to be re-echoing the positions of private sector players responsible for deforestation. According to her state actors need to gain autonomy from the entrenched private interests. She highlighted situations where powerful western countries at the forefront of the fight against deforestation and biodiversity loss were found to as the same time funding businesses that were carrying out deforestation in the tropics. She posed a highly rhetorical and philosophical question, “Who has the right to Deforest?” The question period that followed the three presentations was equally exciting and informative, and speakers had the opportunity to explain further earlier statements made and concepts raised. A fifteen-minute coffee break was given and participants had a great opportunity to interact and network. The panel discussions commence shortly after the break. 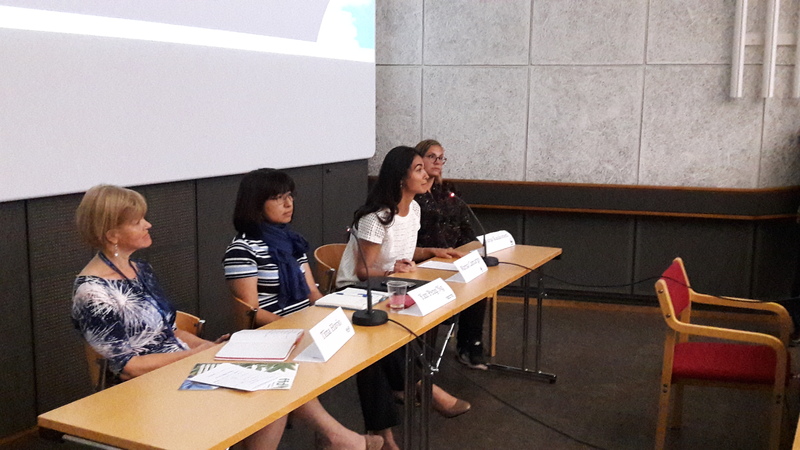 The all-female panel was made up of Marisa Camargo, Strategy and Sustainability Expert, Indufor Oy; Yan Peng Ng., Sustainability Specialist, Neste Oy , Maija Kaukonen, Forest Expert, WWF and Tiina Huvio, Program Coordinator, Finnish Agri-agency for Food and Forest Development. The four panel members made short presentations and raised a number of pertinent issues surrounding the objective of achieving ‘zero deforestation’ in the production and supply chains of the five key commodities. Indeed one of the panelist added rubber production as another key commodity causing deforestation in the tropics. They led discussions into what their various organizations were currently doing to help achieve zero deforestation. They stressed the need for a multi-stakeholder approach and the need to focus on livelihoods of the farmers and smallholder actors within the various commodity chains and understand the reasons for their current behaviours in order to be successful in influencing current negative practices. The issue of equitable distribution of benefits was also brought to the fore and all panelist accepted the need for greater for transparency and traceability within the commodity chains to achieve sustainability. A key question posed was “Who benefits from deforestation?”. It is when we achieve sustainable production of these commodities that zero deforestation can be achieved. According to the panelists deforestation is a multifaceted problem and is not just an environmental issue, but also closely linked to economic, social, cultural, fiscal and policy environment within which these industries operate. The seminar closed around 4.00 pm and participants applauded the high quality of the presentations and discussions that took place and were seen outside in the corridors after the event continuing with the discussions in smaller informal groups. All’s well that ends well. The new week began, and it was the last week we had studied at the Helsinki Summer School. Agroforestry and biodiversity is our first class this week. We learned from Eshetu Yirdaw the diversity of agricultural forests with different species of species. For example,the diversity about faunal、soil microbial、functional groups. When the teacher talked about the invasion of alien species, I think about my country (China) water hyacinth – an invasive species. At the end of the class, the teacher invited us to think about the conservation strategies for biodiversity and showed us some of the measures. After a brief break, Adriàn Monge-Monge began to introduce the risks of the climate environment. For me, just started to learn a few professional terms (vulnerability、livelihood、IPCC、CBA), The teacher explained in detail the concept of these keywords. After lunch, we have a course on the 4 floor of the GIS-class about CRiSTAL and ATLAS.ti. After a simple understanding, I found that the two tools for the project analysis and research has a great help. but this does not affect me, I am looking forward to show our group work. 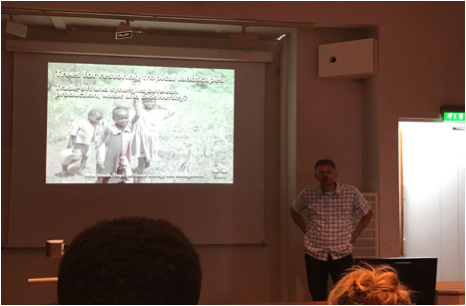 Today’s topic was Climate change, forest, carbon and Carboscen presented by Docent Markku Larjavaara of VITRI, University of Helsinki. He explained the definition of recent global change and climate change from the concept that increasing carbon dioxide influences temperature and which then influences precipitation pattern. Along the way he did mentioned that it is easier to measure the changes to temperature pattern then the changes in the precipitation pattern. 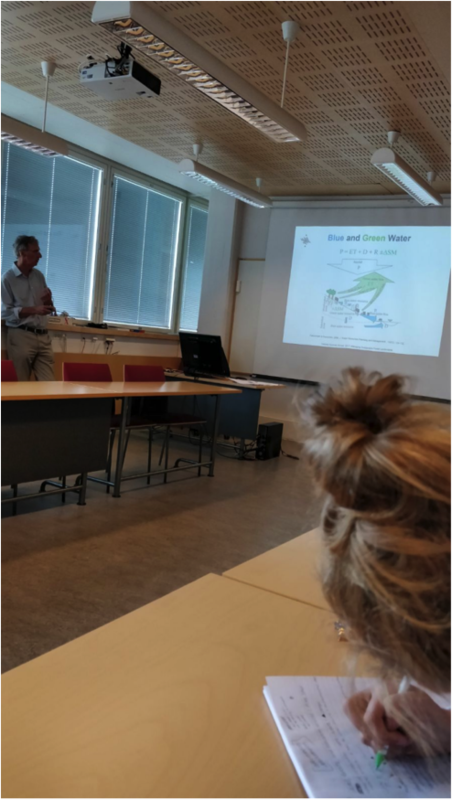 He showed us the interconnectivity between the plants, greenhouse gas and climate and talked about the influence of albedo in the global temperature. Snow with higher albedo reflects more light back to the space compared to the low albedo of the forest which absorbs more light. Also talked about the influence of ocean current on the global temperature. But our focus subject for the day was plant, carbon dioxide. Because of the increasing carbon dioxide, the global temperature is increasing as a result of the greenhouse effect. This increasing temperature and carbon dioxide is good for the plant growth and increasing biomass as a result of the phenomenon called carbon fertilization. He defined carbon pool and carbon flux in the ecosystem and he mentioned that in his work is focused on carbon pool. He showed us a figure of a tree and showed that basically every part of the tree contains carbon. Defined the biomass of the ecosystem and not only the biomass above ground makes the whole biomass of the ecosystem but dead parts of the plant in and on the ground, are also part of the biomass. Next we participated in a quiz. He introduced us to the carbon payment system, an incentive based system for maintaining or increasing carbon pool in the forest. But also discussed the difficulties of implementing this system. 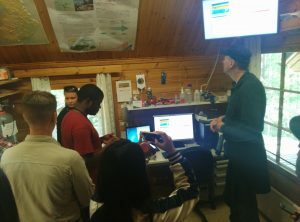 He introduced to us a software called Carboscen which quantifies the ecosystem carbon if the land uses are known and showed us how this software works. We participated in a workshop where we used Carboscen to investigate scenarios of our choice and we produced five scenarios and presented our result. The scenarios were cocoa -forest landscape of southern Ghana, cropland-tea-forest landscape of Sylhet Bangladesh, land use of Montana United States, Forest- cropland of south China and land use of Congo Basin. After our presentation Markku showed his work using Carboscen and application of Carboscen as a workshop in 8 different landscape in 4 different countries Mexico, Peru, Tanzania and Indonesia. 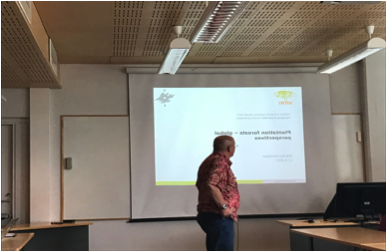 Also showed us application of Carboscen when carbon simulation was based on interviews, topic of the interview was carbon rent and investigated countries where again same but with the addition of Finland and showed us the results. Last application of Carboscen that he showed us was simulation based on Biodiversity and Biodiversity value. That brought us to the end of the days lectures. A new day! Although today is cloudy, I’m still very energetic. 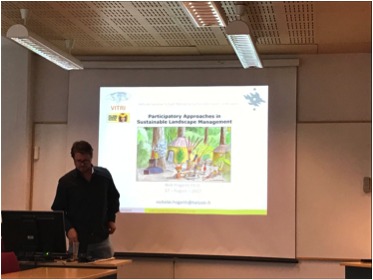 The first lesson Dr. Nicholas Hogarth told us about Participatory Approaches in Sustainable Landscape Management . At the beginning of the class, he said that he once went to China, so it made me feel very kind. To begin with, He told us Participatory Approaches definitions, background and rationale. An approach that actively involves and empowers stakeholders in: planning and decision-making process; implementation; benefit sharing; monitoring and evaluation. Secondly, he teach us Participatory in Natural Resource Management. More participatory, bottom-up vision of development to allow the “common sense”&”social capital” of communities to play a more central role in decisions that affect them. At last, by illustrating the example The Landscape Approach we understand that Participatory Approaches approaches and methods. At the end of the first class, our careful assistant provided some biscuits and drinks for us. The second class is the one of the most expected lesson for me, because my major is closely related to remote sensing in China. 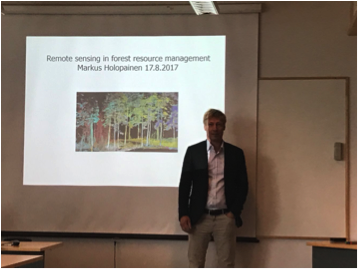 Then the professor Markus Holopainen gave us a wonderful lecture about Remote sensing in forest management. I known much more knowledge about forest resource management and Geoinformation-Science Lab, 3D/4D remote sensing and ongoing research projects and so on. After a good lunch, I was full of energy. This lesson hosted in the lecture hall. And it is also the first time I came to the school hall, so everything seems to be serious and academic. We listened to this report with a lot of famous professors. When report finished, we also made an excited discussion, which gave me the strong academic atmosphere and feeling in this famous university of Helsinki. The last lesson today given by Pro. 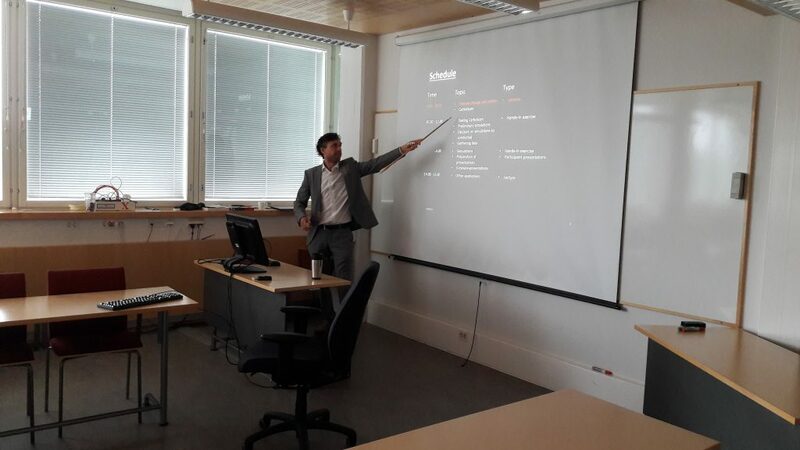 Markku Kanninen taught us some information about forest plantations—-global perspectives. The main contents consist of the basic concepts and definitions of forests, development of plantations, role of plantations in timber/fiber production, managing biodiversity in tropical plantations and some future challenges about forest plantations, etc. How do I begin this post. I was a couple of minutes late for class this day as i missed my bus. I arrived with the class already in session, led by a cheerful Marisa Camargo addressing the drivers of deforestation to promote sustainable landscapes. After a few minutes i got really interested in the subject. The major drivers of deforestation were discussed with most students expressing their views. All agreed that agriculture, particularly slash and burn farming systems are a major threat to forest ecosystems. Plantation farming of important crops such as oil palm, cocoa, soy bean and others were discussed. Other drivers of deforestation were discussed as livestock rearing, infrastructure and rapid urbanization. Next on the table was a series of carbon projects such as REDD, REDD+ and other projects that aim to reduce deforestation and general forest degradation by giving some payment to farmers and communities for their roles in conserving forests.The advantages and drawbacks of these forest forest carbon projects were heavily discussed. 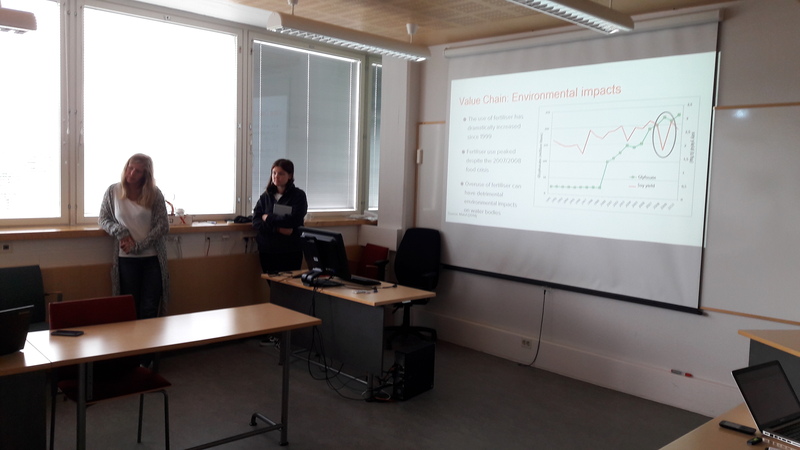 The group works were particularly a good way of understanding the roles that many multinational companies such as Barclays, Walmart and L’Oreal play in deforestation. By getting an understanding of their operational activities, one is then able to completely appreciate the relationships that exist between a company like Barclays and grassroots deforestation. The projects and actions to protect the environment that had been undertaken by these corporations were also discussed. 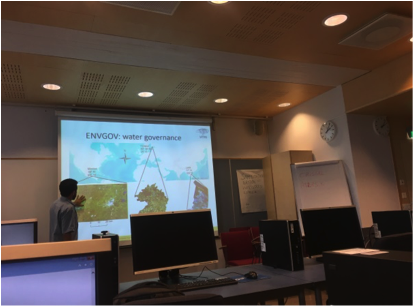 One concept, Ecosystem Services, which has being a major topic in the summer course was brought up again. Briefly, the class discussed the provisioning, regulating, supporting and cultural functions of ecosystems were discussed. More light shed on the water use of eucalyptus plantations. It turns out they do take out a lot of soil water from the soil. The class also discussed the water cycle and links to agricultural productivity and climate change. Deforestation has many harmful effects on the water balance of forest ecosystems. Deforestation affects forests by altering the rates of evapotranspiration, surface runoff, availability of soil moisture for plant growth, etc. Predicted climate change scenarios. The effects of deforestation on the weather and climate were discussed. 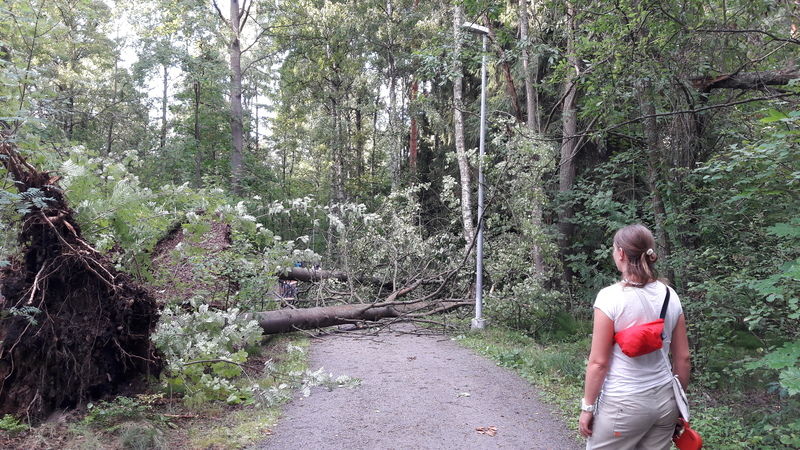 For example, the annual precipitation in finland may not change but the amounts of precipitations during the different seasons would change, for example raining more in summer. Also an expected rise in temperatures., snow melting earlier leading to flooding in some areas Although just a precipitation based on a model, it can serve as a guide for future decisions. Other effects on soil moisture storage and biomass were discussed. It was really surprising to know the amount of water that it took to produce the very basic of items such as food. For example, I was to shocked to find out the volume of water needed to produce a cup of coffee, factoring the water used for irrigation, processing, etc. It was a staggering 140 liters! The picture below shows how much water is used in some basic commodities. Having carbon and water footprints on labels on food and drinks could raise people’s awareness on these issues and hence would raise their interest to help in conservation by changing eating habits to save the world. Forests cover a third off all land on earth and play a key role in our life so it is necessary to know about forests, climate change, biofuels, gender, conservation, trade, deforestation, food security, illegal logging, governance, biodiversity, challenges of forests and landscape management around the world. so fortunately we found this best opportunity and golden chance with Helsinki summer school to study in this field and share this information with others. I found this course (Managing Sustainable Forest Landscapes) very important and full of useful information, also teaching method is excellent. 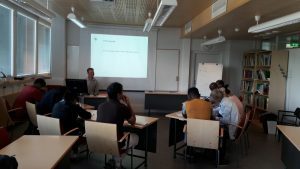 We learned about Landscapes Management, introduction of Ecosystem Services and climate change from Prof. Markku Kanninen Director of Viikki tropical resources institute at university of Helsinki then we had a group work instruction by Prof. Markku Kanninen and course coordinator Mr. Mikko Kaija. 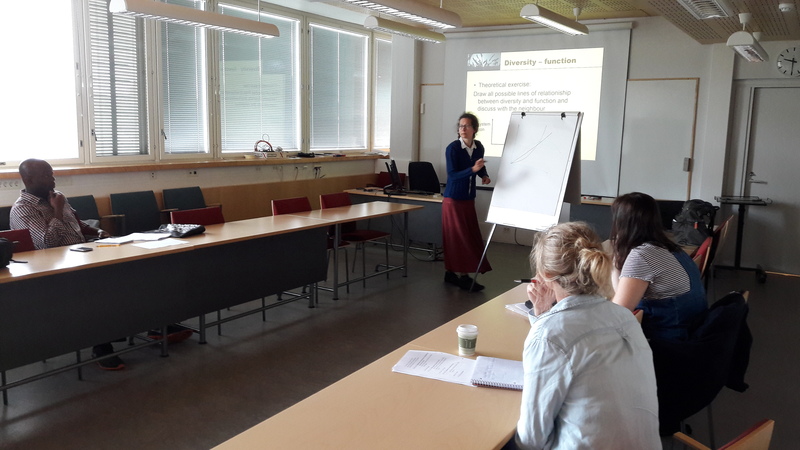 We learned about biodiversity as a foundation for ecosystem services by Iryna Herzon and we had a short information about Master program at the field of forest sciences, finally after lunch break we had a lecture about valuation of ecosystem services by forest economic Mika Rekola and we had enough time for questions and discussions. We are now at the middle of course time and we have to continue. of course I am a little bit under the pressure of lessons and volume of lessons but it is not boring me because I can ask from our teachers when necessary. Back to Helsinki and it is first Monday of the course. Weekend was not as mellow as picture of Helsinki looks like. 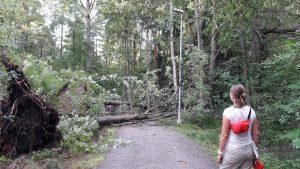 A strong storm and rain clouds suddenly came Saturday evening and caused damage to households and felt trees down to ground. I spend some time helping locals near my neighborhood because that was a time when people with knowledge of forest were needed. But back to the course. 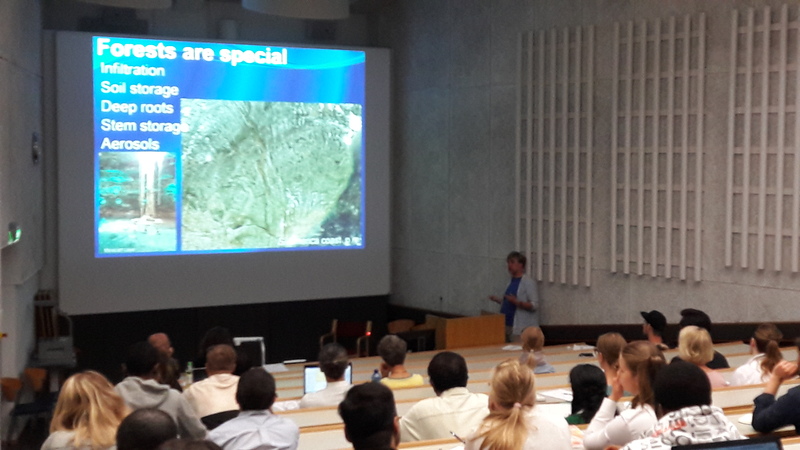 Professor Markku Kanninen started his presentation with introduction to the landscape management and ecosystem services. We learned basics of ecosystems and whole scale how to define a landscape. 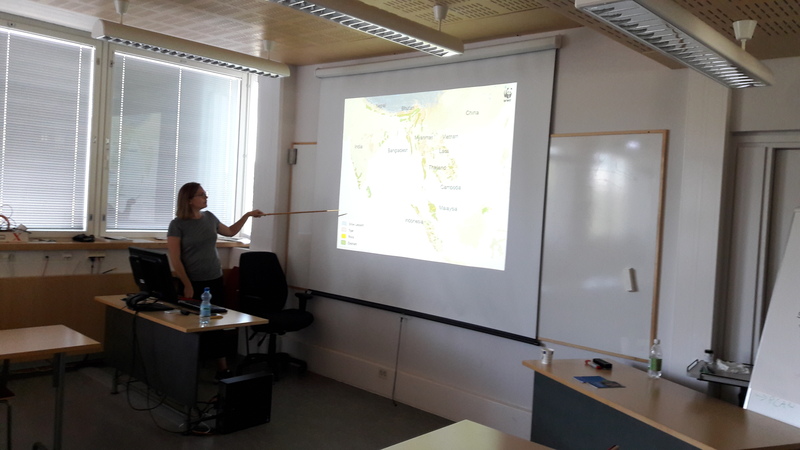 After lunch break we got an interesting presentation from a guest lecturer of WWF ‘s Maija Kaukonen who has been working in Nepal and Indonesian projects. Forests are vital and important to many species and conservation programs are trying to deal above borders of different coutries. That is a complex situation because Nature works beyond borders. WWF is consulting governments, landowners and different stakeholders to put up participatory planning in progress and trying to manage landscapes for making environment better for biodiversity and people also. The last one of days lecture was to introduce the group work assingment. Students will produce presentation and final report of one of main commotidies of today’s world. Soy, Palm oil, Cocoa and Beef/Cattle. Each group picked up one commodity and will write a final report of the one they got. We will look forward to hear your presentation during last days of our course. Day four of the course began at the Hytiälä Forestry Field Station. 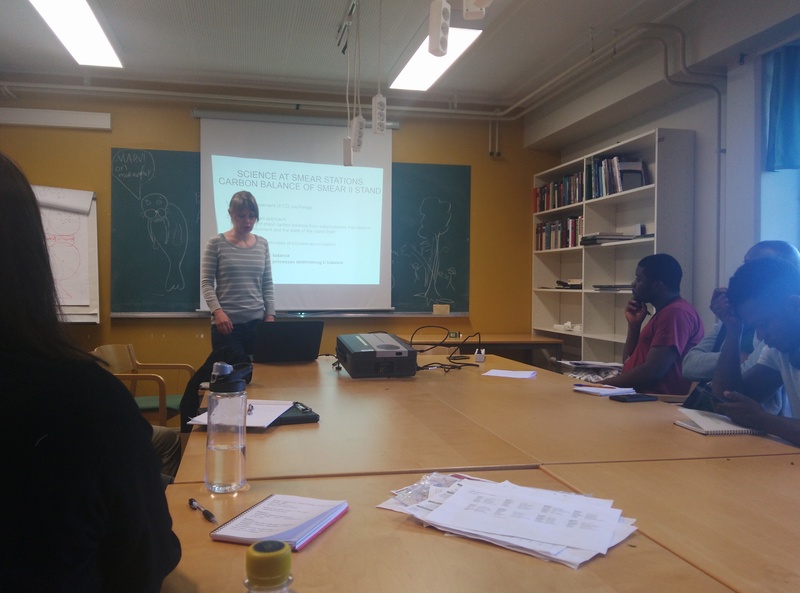 The students enjoyed a discussion on the subject of forest ecosystem-atmosphere interactions by Pauliina Schiestl-Aalto; a doctoral student specializing in forest-atmosphere interactions at the University of Helsinki. 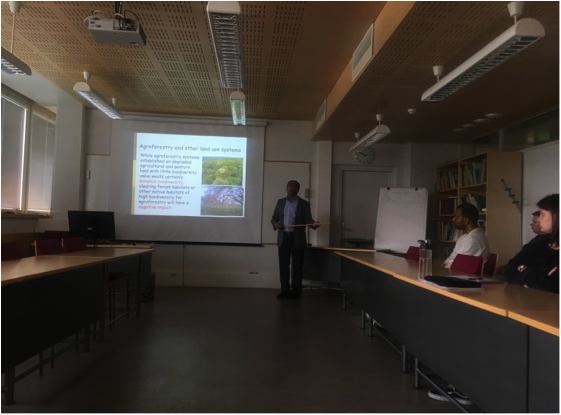 The aim of this presentation was to help the students understand the mechanisms involved when forests (land ecosystems in general) interact with climate as well as to gain an understanding of how these interactions are studied. Docent Pauliina Schiestl-Aalto explained four ways forest vegetation affect climate: forest takes up and releases atmospheric CO2; it directly modifies the surface radiative properties of the earth; it contributes to the atmospheric chemistry and particle formation; and forest releases water vapor into the atmosphere. The students were helped to understand that the impact of forest on climate may be different depending on whether we are talking in the context of tropical forest, temperate forest or boreal forest. Various interaction mechanisms (carbon sequestration, radiation absorption, evapotranspiration and aerosol formation) which play important roles in understanding the impact of forest on climate were highlighted. These different interaction mechanisms are studied at SMEAR (Station for Measuring Ecosystem Atmosphere Relations) stations. However, the effect of aerosols in forest-climate interactions remains unknown in the scientific community. 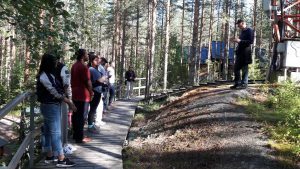 Later, the students were taken on an excursion to SMEAR II- station at the Hytiälä Forestry Field Station. The students were given a talk and tour of the SMEAR II-station by Janne Levula- a research technician at the University of Helsinki Department of Physics. 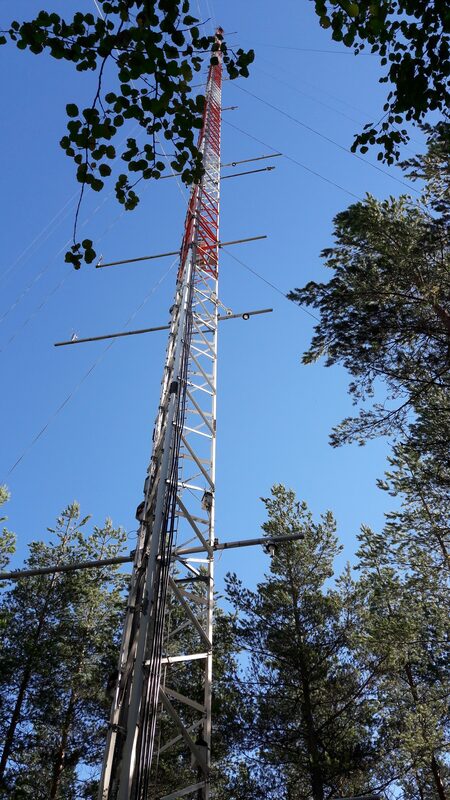 The SMEAR II-station is one of five multidisciplinary research stations measuring forest ecosystem-atmosphere relations in Finland. The SMEAR II-station is a leading aerosol research center in the world and holds the record of the longest time series of aerosol formation over forest (since 1197) as well as one of the longest measurements of net ecosystem exchange of CO2 and component processes in forest (since 1996). 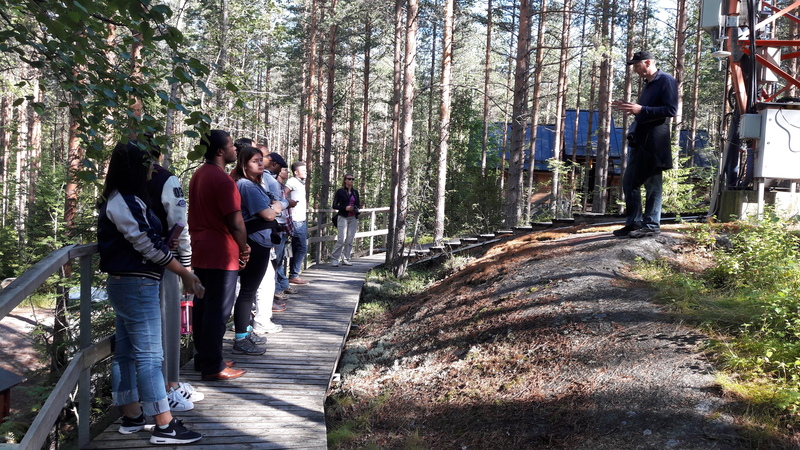 Finally, the students departed the Hytiälä Forestry Field Station to their individual accommodations after spending two days at the research facility.